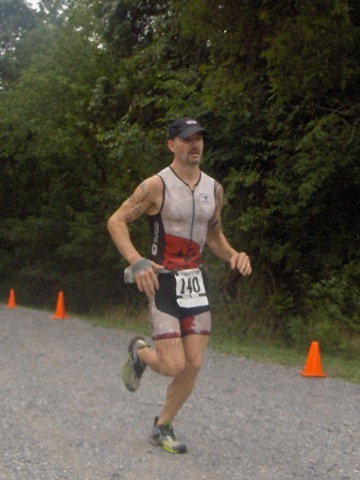 I raced the XTERRA Panther Creek Tri back on August 1st. I know, I know. That was 4 weeks ago. After some pestering from a few of my buddies who wanted the low-down, I figured I would post it anyhow. 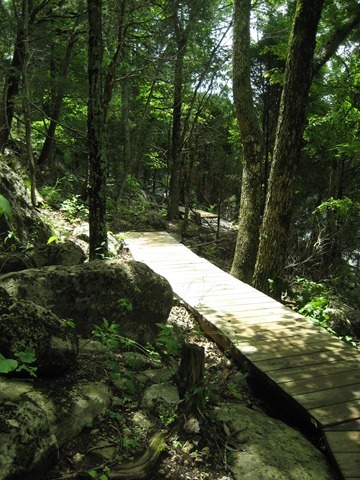 Plus, with going into my next race, I have been thinking a lot about Panther Creek, as any racer should. What went right? What went wrong? What changes should I make to improve? You get the idea. So since it’s been on my mind lately, it does make it easier to throw it on paper. Well, uh, not really paper, but again, you get the idea. For the second year in a row, it was a wet course. It was on and off raining in the area the 24 hours leading up to the race. I wasn’t overly nervous about it, as I had a pretty good race there last year and it was muddy as all get-out. Fred and I had chatted a couple of times leading into the race and we hooked up on race morning to talk strategy among miscellaneous small talk. It was still on-and-off misting as you could tell from the foggy camera lens in the picture below. Like last year, the bike course was modified slightly to prevent the racers from going through a slick boulder and bridge section. It’s a fun, fun section when it’s dry, but could be very, very sketchy when wet. Here’s a dry picture of the section that was cutout. After getting transition all laid out and things ready for the race, Fred, Dan, and I decided to head out on the course for a little quick pre-race warmup. This also gave us an opportunity to check out the course and to see if my decision to go gloveless would work given the wet conditions. It was slick as expected with every wet root acting like a gremlin to throw your wheels out from under you. The ESI Grips worked well, even wet and even without gloves. I was pleasantly surprised as I knew that going gloveless could save me time in transition, especially if it continued to rain. Have you ever tried putting on wet gloves? 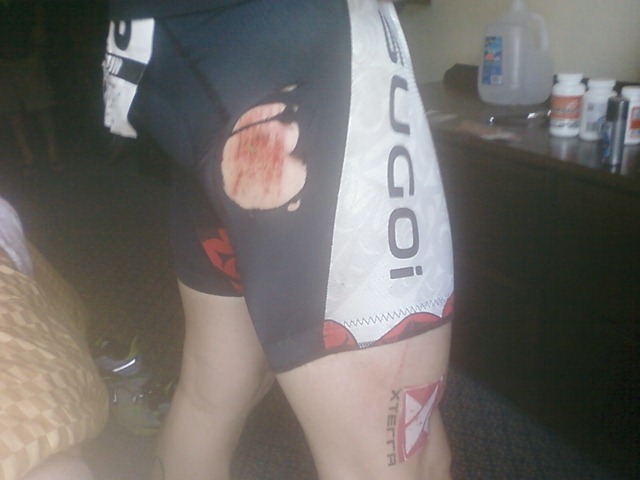 On a second lap of the section we decided to pre-ride, I opted to push things just a little too hard. Inevitably, I crashed. Not only did I crash, but I did so twice. The second time down, my decision to go without gloves bit me. While hitting the dirt, I tried to catch myself and both of my hands scraped across sharp, pea-sized gravel. The result were cuts and scrapes to both of my palms. 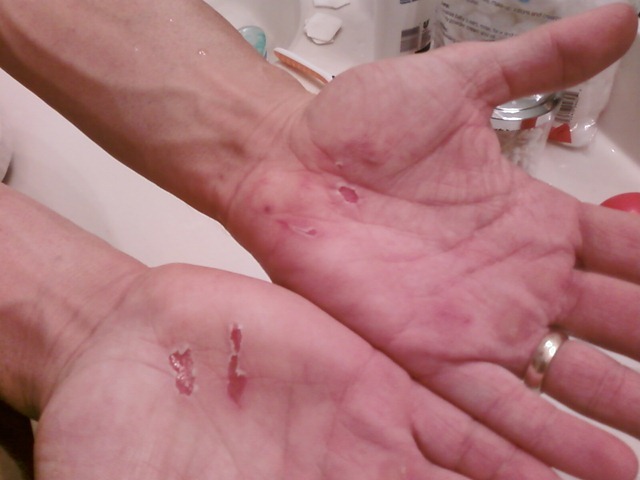 The pic below was from post-race while cleaning the wounds. Can you imagine what they looked like bloody? Getting back to transition, I grabbed my Bellwether Scout gloves from my transition bag and placed them in their appropriate spot. There was no way I was going through that twice. I headed down to the water for a warm-up swim. During the swim, as soon as I took off, the first couple of strokes were painful. I expected the cuts to sting, but that wasn’t the problem. The real pain came from the fact that my right palm was not only cut, but bruised quite a bit. Matter of fact, it had already begun to swell and discolor. “This is not going to be fun on the bike,” I thought. After my warmup swim and RIGHT before the race start, I ran back up to transition and swapped my Scout gloves for a pair of the Bellwether Supreme gloves. I normally reserve these for road biking because I favor full-fingered gloves on the mountain bike. My decision to use them was based up the fact that they have a padded palm. They ended up being saviors on the bike course. The swim consisted of a 400 meter course of which we would have to two laps. On the first lap I attempted to keep a strong, fast pace to stay ahead of the main pack. I knew I couldn’t keep up with Fred’s super-fast pace, so rather than blow up trying, I just kept him in sight and settled into my own pace. 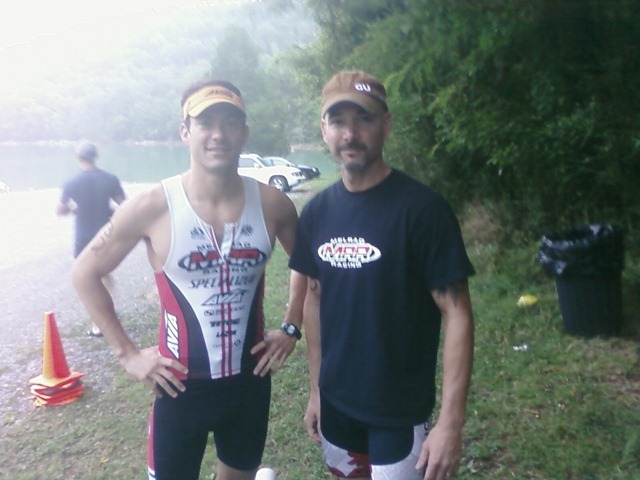 I was in 6th place coming out of the water and couple of minutes behind Fred (pretty significant on such a short swim). My transition went super smooth and I entered the trail in 4th place. I passed another racer very early in the bike which put me into 3rd. 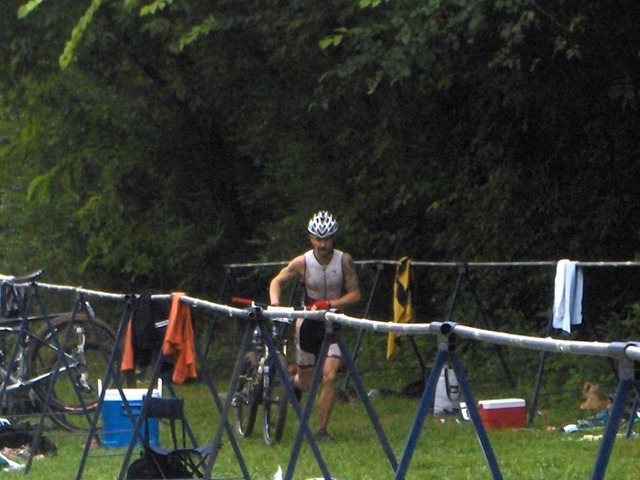 I held 3rd place for a good portion of the first (of two) laps. That’s when my friend Dan caught up to me. “Abracadabra,’ he says as he passes me. We stuck together into the second lap. About a third of the way through, I crashed again on slick roots, hitting more sharp gravel, taking a huge chunk out of my tri suit and my arse with it. I shook it off quickly and kept on trucking. About the time I caught back up to Dan, I heard Ryan Oconner behind us and I informed Dan that we had a tail. Ryan kept his pursuit and eventually passes me once the trail widened. Shortly after his pass, I tried to pick up my pace in an effort to keep on his tail. It wasn’t long before the conditions took over and I crashed, AGAIN. Same side, same area, leaving more arse on trail. This allowed both Dan and Ryan to get out of sight. I continued my pursuit to both catch the guys in front and to ward off anyone trying to catch up. As I was about to finish up the bike leg of the race, Bence Roemer catches up and takes a pass. Sore and beat up, I entered T2 and ditched the bike gear as quickly as possible. It went pretty smooth and I went into the run in 6th place overall. After about a mile or so of technical single-track, the run course opened up onto a gravel fire-road. I could see Bence in the distance and tried my best to reel him in. Once we entered into a lolly-pop loop section of the course, I wouldn’t see him again. Matter of fact, I didn’t see or hear anyone for the rest of the run. I spent it all alone till the end of the race. Since the conditions were quite muddy, I was a little concerned that the Avia Avi-Stoltz shoes would get clogged up and lose grip. Only in the most extreme, greasy mud did this happen (which any shoe would have had trouble). The rest of the time, they worked like champs. I held 6th place overall and first in my age group. Great race and good times! Congrats to teammate Fred Smith for taking 1st place overall!! You always were the daredevil. Sixth ain’t bad, my man. Panther Creek’s right up from the house…I’ll havta try to come check that out next year.